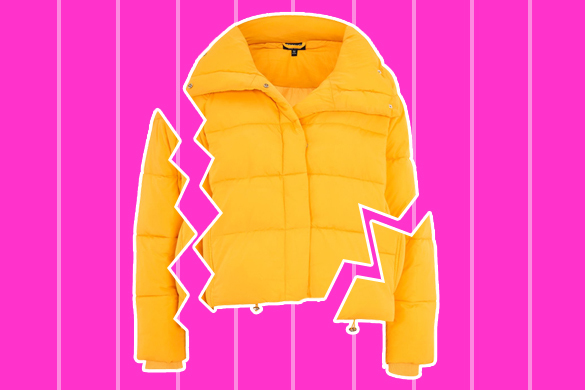 The idea of cheap clothes falling apart is a cornerstone of the argument against fast fashion. It’s a go-to complaint and tool for those who aim to turn people away from their high street shopping habits and towards, generally, more expensive clothes. And it fits neatly into the narrative of disposable fashion; a top or a dress that spends less time in your wardrobe than it did on the rail at the shop. – How are these people washing their clothes? – Are they throwing rocks in the machine instead of detergent? – Are all these people somehow, collectively Edward Scissorhands? – Do the clothes actually fall apart as they’re walking along the street, piece by piece, or is it more like a slowly unraveling seam? Now, when clothes are being made at lightning fast pace by people (predominantly women) under extreme pressure, quality isn’t the focus. It’s a numbers game and impossibly high volume is the ultimate goal. Materials are cheap and labour is even cheaper, so I’m not going to pretend that fast fashion represents any sort of aspirational level of quality but nor am I going to say that all cheap clothes are guaranteed to fall apart. Firstly, it’s not true and secondly, it doesn’t get to the heart of the real argument. Let’s take a step back to the first point; it’s not true. Cheap clothes simply don’t always fall apart. Sure, I’ve had loose buttons and a few unfinished seams but I just had a look through my wardrobe and a lesson lurks within it. While fast fashion doesn’t occupy much space on the rail, there are a few bits here and there left over from my questionable days as a dedicated high street and ASOS shopper. None of it is falling apart. What is falling apart though, is every single thing I’ve ever bought from Paul Smith. Significantly more expensive than anything I ever bought from the high street (but subsidised by a particularly generous staff discount at the time), my Paul Smith pieces have the highest price tags of anything I’ve ever owned and yet represent the worst quality. From torn pocket linings and frayed fabric to threadbare seams and cracking soles, I’ve never experienced anything on that level with fast fashion. I’m not trying to slate Paul Smith and I’m certainly not trying to craft any sort of robust defense of the high street, but the point I’m making is that price doesn’t always signify quality one way or the other. It can. It can signify everything from fair payment and treatment of workers to poorly sourced materials. It can be a hint at what’s going on behind the scenes but it doesn’t paint the full picture. Let’s not forget that plenty of high end designers use exactly the same factories as fast fashion brands. Price and quality, or a lack thereof, don’t necessarily go hand in hand. Which leads us back to the second point; the heart of the argument. Why are we even talking about these clothes falling apart? Why are we entertaining fast fashion with any sort of expectations? Not because of the price but because of the conditions in which the clothes are made. The people sat at sewing machines for hours upon hours can’t sew perfect seams every single time and why should we expect them to? Yes our clothes should last longer but our disposable attitude towards clothes has its roots in fast fashion’s pace not its standards. We need to question the unhealthy culture rather than the quality because, unlike a few dodgy seams, that’s what pervades the industry as a whole. Fast fashion doesn’t warrant any lofty expectations, and decrying the clothes the industry churns out as poor quality suggests that it does. Clothes falling apart after one wash isn’t a guarantee of the fast fashion process but, as it stands, despicable wages, harmful manufacturing practices and dangerous working conditions are. So let’s focus on that. I agree, it is a weak argument, especially when people don’t even hold on to their clothes long enough to notice if they’ll last. Do they even care? It’s just another ploy by the competition, fast fashion disguised as something better? The Paul Smiths of the world. I don’t even know what you call them. I agree that it’s a weak argument. A lot of my clothes (that aren’t made by me) are fast fashion/High Street purchases but they’ve been in my wardrobe for years. I have no issue with the quality. You do have to wonder what people are doing with their clothes for them to fall apart so readily! If we’re going to tackle fast fashion, you’re right that we need to do it based on working conditions, pay, etc. I was worried people would see this piece as a bit of a defense of cheap clothes so I’m glad so many people like you have gt and agreed with the point. I love this post! It’s hilariously written and so true. Like you, I’ve got some leftovers in my wardrobe from when I didn’t shop ethically. One Primark long-sleeve in particular has been with me for 6 years without falling apart. And I’ve also had the sad experience of mid-range clothes not holding up to my expectations of quality. Thanks for stating so clearly why ethical fashion matters! H&M clothing actually did routinely disintegrate while I was wearing it in the past, legging seams pulling open in places and once the leg of my jeans tore in half. I was feeling a little heavier than usual, I may have put on weight, but, ouch.